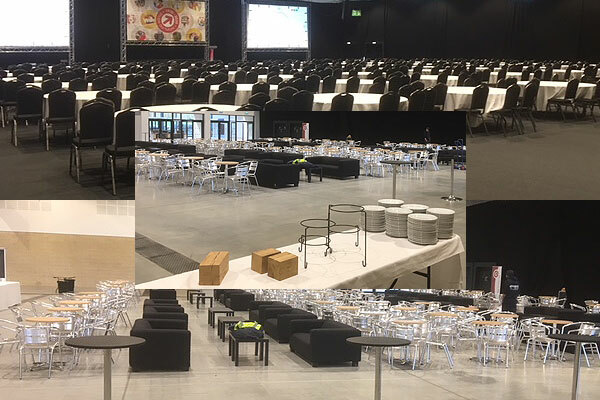 Yesterday saw some of the logistics from our Bradford sales and distribution centre supplying and setting up event furniture at the Yorkshire Event Centre in Harrogate. Boasting 2 large halls of space, the Yorkshire Event Centre is perfect for all different types of events including exhibitions, conference, dinners, weddings and concerts to name just a few. This particular event is a blue chip company conference into which Event Hire supplied 60 round 6ft banqueting tables, 480 charcoal banqueting chairs, 200 metal café chairs, 22 settees, coffee tables, poseur tables and bar stools, providing an unrivalled one stop shop of event furniture. As well as the supply and installation, our client has also taken advantage of our dismantle service as well, providing them with a seamless service, allowing them to concentrate on other areas of the event, safe in the knowledge that furniture for their event is in safe hands. You can hire event furniture in the quantities you need today from Event Hire UK – the country’s leading furniture hire for events company. We have sales and distribution centres nationwide so can service most events and occasions, so why not contact us today and find out for yourself why we are the #1 go-to destination for event planners around the country.